The second most evil person in A New Hope, Tarkin represents the face of the Evil Empire that Leia is rebelling against. Played by British Actor, Peter Cushing, Tarkin was a very quotable character. His strong supporting role in the film assured his character's place in film history - most notably for being able to control Darth Vader by word alone and for being the guy that gave the order to destroy Leia's home planet of Alderaan. This next conversation became a classic Star Wars moment. It showed that even though Darth Vader appears to be the bad guy, Tarkin controls Vader, so he must be pretty powerful himself. The conversations also contains the famous Darth Vader quote to Admiral Motti, "I find your lack of faith disturbing". Princess Leia Organa: Governor Tarkin, I should have expected to find you holding Vader's leash. I recognized your foul stench when I was brought on board. Governor Tarkin: Charming to the last. You don't know how hard I found it, signing the order to terminate your life. Princess Leia Organa: I'm surprised that you had the courage to take the responsibility yourself. Governor Tarkin: Princess Leia, before your execution, I'd like you to join me for a ceremony that will make this battle station operational. No star system will dare oppose the Emperor now. Princess Leia Organa: The more you tighten your grip, Tarkin, the more star systems will slip through your fingers. Governor Tarkin: You would prefer another target, a military target? Then name the system! I grow tired of asking this so it will be the last time: Where is the rebel base? Princess Leia Organa: ...Dantooine. They're on Dantooine. Governor Tarkin: You're far too trusting. Dantooine is too remote to make an effective demonstration - but don't worry; we will deal with your rebel friends soon enough. Governor Tarkin: Terminate her... immediately! Voice over comm: We have an emergency alert in detention block AA-23. Governor Tarkin: The Princess? Put all sections on alert. Darth Vader: Obi-wan *is* here. The Force is with him. Governor Tarkin: If you're right, he must not be allowed to escape. Governor Tarkin: Are they away? Darth Vader: They've just made the jump into hyperspace. Governor Tarkin: You're sure the homing beacon is secure aboard their ship? I'm taking an awful risk, Vader. This had better work. This was a key plot point that many people miss - Tarkin had ordered the Stormtroopers that Leia and her rescuers NOT be shot - so they could escape and thus be followed to the hereabouts of the elusive Rebel Base could be discovered. It's a myth that Storm Troopers couldn't shoot anything in A New Hope! Commander #1: We've analyzed their attack, sir, and there is a danger. Should I have your ship standing by? Governor Tarkin: Evacuate? In our moment of triumph? I think you overestimate their chances. Original on the left, CGI on the right. 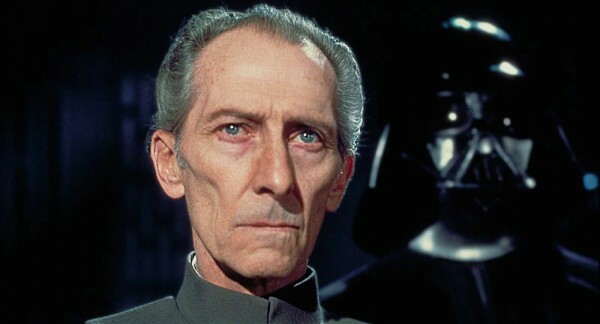 Grand Moff Tarkin: Failure will find you explaining why to a far less patient audience. Grand Moff Tarkin: We need a statement, not a manifesto. The Holy City will be enough for today. 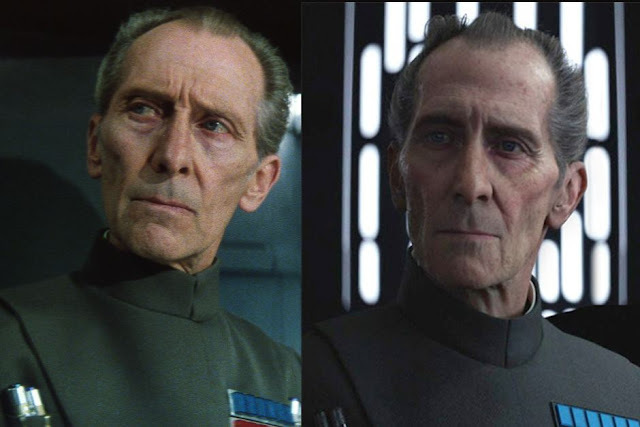 Tarkin also appeared in Revenge of the Sith but did not have a speaking part. It is the long-lasting legacy of Tarkin that his character was used in Star Wars: Rebels and had a book dedicated to his back story story. Buy it from Amazon. What about his quotes from the Clone Wars series. He was a captain of the Republic in a couple episodes.